My interview of Wreckage by Emily Bleeker appears on page 15. 1. In one paragraph, summarize your new book, The Practical County Drama Queen. In The Practical County Drama Queen, eleven-year-old Frannie has ten weeks to stop her older brother Ronnie from making the biggest mistake of his life. As the youngest of Practical County’s Ryan family, Frannie has grown up watching everything. Watching her older brother and sister show steers, watching her Granddad work with the cows and calves, and watching the Darling sisters manipulate, lie, and cheat at the Practical County Fair. Frannie has also grown up knowing that, if she’s persistent enough, she can usually accomplish whatever she set out to do. But in this summer tale of growing up and letting go, Frannie begins to realize that some things in life just might be beyond her control. 2. What was the inspiration behind your main character? Frannie was a fan-favorite character in my debut novel, The Beef Princess of Practical County. Then, she was a precocious preschooler with a huge vocabulary and an even bigger imagination. Readers begged me to give Frannie her own story. So, Frannie grew up a little, and what a story she has to tell! 3.	Who are your favorite authors? I have always had great respect for Katherine Paterson. And, anything written by Cynthia Rylant is golden in my eyes! Patience. It goes against my nature to be patient. But authors know that the publishing world moves at a turtle’s pace. If you can’t be patient, you’ll give up before you get to the best part! 5. Were you a drama queen as a teen? Me? (Laughs hysterically) Oh, pul-eeze! Why you even ask me that? For crying out loud! A drama queen? Ha! Really. (Rolls eyes). 6. If you were to describe yourself as a type of livestock, what would you be? I’m probably a mother hen. I could curl up on a nest and brood all day. 7. What are your writing strengths? I’m an instinctive writer. I don’t follow an outline. I break a lot of “rules.” I like working on character and setting. Planning out the plot gives me fits, so I usually just write and see what happens. Is that a strength? Or chaos in action? I’m not sure, exactly. One would think! But life is tricky sometimes, isn’t it? 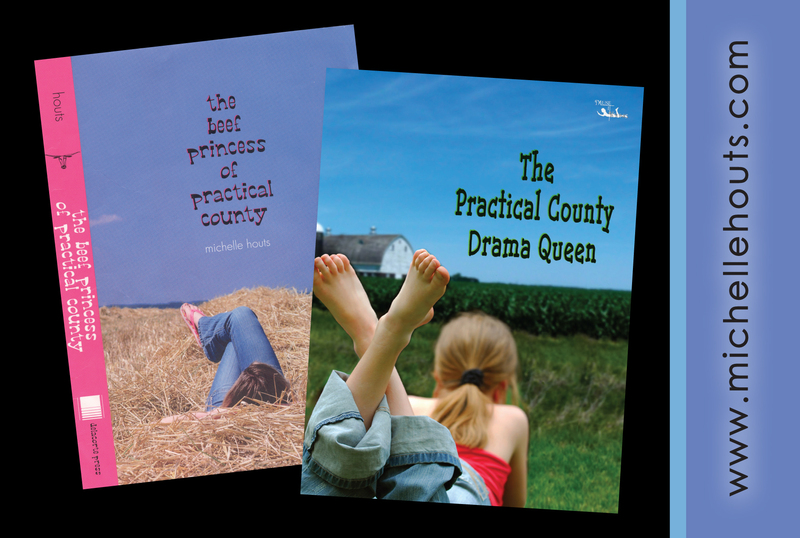 I entered The Beef Princess of Practical County in the Delacorte Dell Middle Grade Fiction Contest in 2008. I didn’t win. No one did, actually. It was one of the years they didn’t choose a winner. But shortly after, I got a call saying I was a finalist. And, would I be willing to do some work on the novel and resubmit it? Uh, sure? Of course! So, Beef Princess was sold to a Random House imprint without an agent on a second try. Not your typical “how I got published” story, I’ll admit. Beef Princess fans asked for more. (But my editor didn’t.) Young readers said, “You should write another Practical County story!” (Hmm, my editor didn’t.) School teachers said, “Frannie surely has her own tale to tell!” (But my editor wasn’t asking for Frannie’s tale.) So, I wrote it. And much to my shock and chagrin, guess who wasn’t all that interested? I know, I know. I’m not the sharpest tool in the shed sometimes. After Beef Princess, I landed a fantastic agent, who sold my middle-grade novel about Danish gnomes at Christmastime (a bit of a leap from cattle farming, I know) to Candlewick Press. That is Winterfrost – due to release 9/9/14. My wonderful agent was determined to sell The Practical County Drama Queen. But we were met time and time again with this: It just doesn’t make sense for us to publish a sequel to something we didn’t publish in the first place. Enter SCBWI. Their member’s magazine had a story last year on E-First Publishers. These publishers put books out in electronic format first. Then, they may or may not offer a print edition. My agent submitted, and MuseItUp offered an electronic AND print contract right away. Frannie’s tale would be told! 9. How do you balance writing with raising a family? Seasons. I give myself permission NOT to write during certain seasons. When my farmer husband is planting or harvesting and I’m doing all the household chores, feeding extra farmhands, and running for parts to fix broken equipment, I give myself permission NOT to write. When I’m hosting the extended family Christmas and working parttime and caring for aging in-laws, I give myself permission NOT to write. It sure beats beating myself up for NOT writing. But when I have a deadline or a blizzard hits or I’m just inspired, I declare a season of writing. And that’s when I give myself permission NOT to fold laundry. It sure beats beating myself up over it. 10. Can you tell us about your writing space? Right now I write just about anywhere I can find a quiet corner. But, I’m working on restoring a one-room schoolhouse built in 1894. It has been used as a barn for more than 50 years, so it needs a lot of work! When it’s done, I want to use it as my writing studio. And, I dream of having a cat there. I’d name her Miss Beadle. The Hedgecock family had the privilege of staying at Tahuayo Lodge in Peru this summer. I was glad that I had read Paul Beaver’s Diary of an Amazon Jungle Guide, prior to our trip. It truly captures the amazing diversity of animals and plants, the fascinating culture of native folks and the magical, mysterious world of the Amazon. In one paragraph, tell us about your book, Diary of an Amazon Jungle Guide. I started the Amazon’s first adventure camping company 33 years ago. I had so many crazy adventures, bringing people into a wilderness that contains the Earth’s greatest biodiversity. So many crazy and funny encounters of people, plants, insects, monkeys, snakes, etc. After 20 years of working in the jungle I found that I was starting to forget some of the crazy times people would recall to me. So I thought I had better start to write things down. Your tales encompass a large number of expeditions and I imagine the material for your book took years to accumulate, but how long did it take you to actually write the book? Once I put pen to paper it just all poured out, 10 chapters worth in about a month. Seven years later I added another 3 chapters. Who is your favorite naturalist? I’ll give you two, Charles Darwin, the father of modern biology and Steve Irwin, who shared such joy of nature in his Crocodile Hunter series; Darwin appeals to my serious nature and Irwin to my crazy, no-holds-barred sense of joy in wildlife adventures. If you were a jungle animal what would you be? People who have camped with me in the jungle say I remind them of a sloth. I don’t know what to make of that exactly; perhaps because I’m always unruffled, even in tense wilderness situations, and always with an absent-minded smile. Your book touches on many interesting topics including the little known ruins, Kuelap, which you say is more impressive than Machu Picchu. Do you think this site will ever achieve the same tourism popularity? It should, if the government ever invests in infrastructure like a good airport and roads. Your honeymoon camping trip in the Amazon was, shall we say, unique. Did you ever take a more traditional vacation? Hah, let me tell you about that. My bride, Dolly, was so uncomfortable and miserable, but I said to her that one day we would just laugh about it. Well once every few years I’ll ask her if she’s ready to laugh about it yet. Finally after about 18 years she says yes, she’s finally ready to laugh. Then just to make sure I ask her again today, and its back to no, it really isn’t funny. Well, maybe in another 18 years…. Your depiction of the riberenos culture is well done in the book. Can you tell us about your wife’s efforts to improve the quality of life for these people? It grew out of her compassion for her sister native women. She wanted to make sure they were not abused and had what they needed for their children. From there it led to economic initiatives for the native women, then a medical clinic (it is probably the finest rural clinic in the Amazon), then educational initiatives and additional health care programs. I hope to add another chapter in a year or two. I have been getting together with my old shaman friend, Cumpanum. He is very old now, as I am. We get together and talk over old times, every conversation starting with “remember when” and ending in gales of laughter. But these talks have given me more insight into his history and life, which I wish to share. I hope you’ve enjoyed learning about Paul Beaver. Learn more about the Tahuayo River Lodge on his website: www.perujungle.com. Dolly’s nonprofit organization (Angels of the Amazon) website is:www.angelsoftheamazon.com. The book is available on Amazon.com bookstore at www.amazon.com/Diary-Amazon-Jungle-Guide-Encounters/dp/0972480919. I have never been a big reader of poetry. But when I do, I tend to love it. I embrace the imagery and the way those lean, clever words make me ponder. Four years ago, at Back to School Night, my daughter’s freshman English teacher read Mary Oliver ‘s The Summer Day (famouspoetsandpoems.com/poets/mary_oliver) to the assembled parents. As a biologist and lover of literature, I cannot believe that I had never heard of this writer. She and I are kindred spirits, yet she unfolds the natural world in a way I have never experienced. After all, I took an Entomology class in college, so how could I not know that a grasshopper chews back and forth? This learned woman who teaches high school English read this poem to us parents, just as she had guided our children through the verses on the first day of school, because of the message in this beautifully written poem. Each stanza draws us in and leaves the reader with a simple reminder: We only get one shot at life. On that night, with a room filled with mothers and fathers, this English instructor closed her book and issued a challenge: Pause and ask yourself a question, not just at weddings or funerals or when you ship your children off to college, ask yourself today this concluding line of Mary Oliver’s poem: Tell me, what is it you plan to do with your one wild and precious life? I shipped my youngest daughter off to college a few weeks ago. I know what I want to do with my life. I want to practice the craft of writing in the hopes that I, too, will capture the power of words — words that will make someone realize that death is inevitable, that every day is a gift, that each moment is an opportunity to reflect on the direction of one’s life. Until then, let me pass along Mary Oliver’s poignant phrase: Doesn’t everything die at last, and too soon?